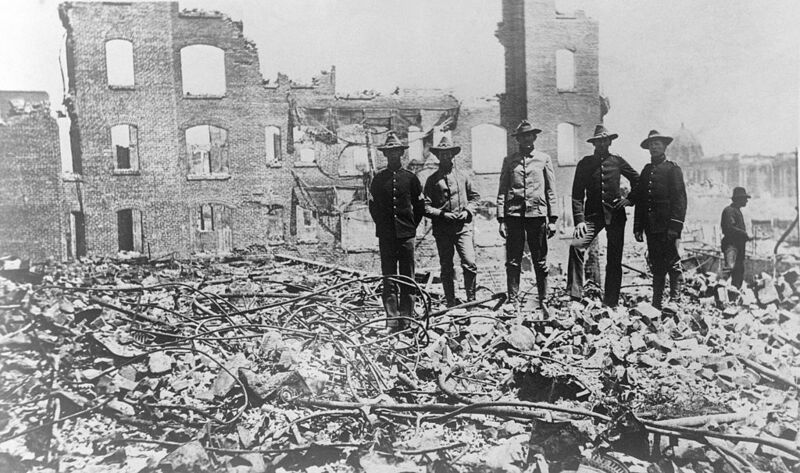 On the Wednesday in question in 1906, San Francisco was reduced to rubble. April 18, 2016 will be the 110th anniversary of the event. The San Francisco Earthquake still stands as one of the greatest catastrophes in American history. It remains a cautionary tale about urban disaster management, and it fuels the imagination of writers of all kinds. The movies brought the human drama of it to me at a very young age. 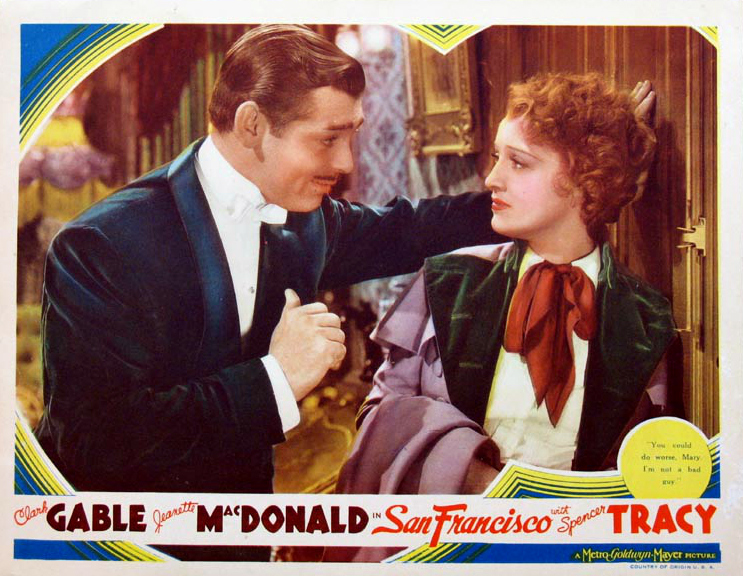 The 1936 film San Francisco, directed by W.S. Van Dyke with screenplay by Anita Loos, played endlessly on 50s television. It made me fall in love with both Clark Gable and Spencer Tracy. Scenes of the earth splitting, of buildings crumbling, of a mother and baby falling from the upper story of a building with its sides ripped off, and of the city consumed by fire inspired horrified fascination. Along the way it fueled my curiosity about real history. Did it really happen? Did the city burn? Did army troops blow up rich peoples mansions? Did the refugees camp in Golden Gate Park? The answers, of course, are yes it did and yes they did. At least the simple answers are. Complete truth is always slippery and myths abound. Did the army take over? Yes and no. Martial law was never authorized, but General Frederick Funston acted as if it had without proper authorization. He remains a controversial figure, seen as a hero by some. More recent research seems to indicate many of his measures did more harm than good. There as looting. There was shooting of looters, but how much remains uncertain. The Army did blow up the houses of the affluent as shown in the film when troops prepare to destroy Mrs. Burley’s mansion. Very early in the crisis the brilliant Fire Chief Engineer Dennis T. Sullivan died, leaving the fire department leaderless. The army stepped in. General Funston and his minions began to blow up blocks, thinking to build a firebreak. Embers from the explosions, however, floated on high winds in uncontrollable directions and started many new fires. Most experts now believe the explosions did more harm than good. Various reports of “thousands dead” appear to be false. Police reported 478 bodies recovered from the ruins, but of course the exact number of dead will never be known. Estimates usually fall between 450 and 700. There were accusations of cover up, however, implying the number to be higher. Golden Gate Park actually hosted two refugee camps. There were also camps at the Presidio and Fort Point. While the refugees lived in tents initially, shacks and cottages eventually took their place in the long months of rebuilding. Luckily hastily written legislation protected what is now Muir Woods from being logged during rebuilding. The movie portrays a remarkably diverse population working together as they march out of Golden Gate Park to rebuild their city. In fact, Chinese-American refugees were often shunted from camp to camp and money sent for relief from China and Japan often failed to benefit Asian-Americans. The ugly side of human nature rears its ugly head in a disaster as some seek to profit from other people’s misfortune. Logging is but one example of profiting from the earthquake. The city attempted to relocate Chinatown—and free up valuable real estate for speculation. It was unsuccessful. Money intended to feed and cloth victims went into more profitable rebuilding efforts. What is going to be the end of the great display of superficial sentimentality for the stricken city? An all-around good deal: Moneyed people, contractors, real estate speculators will make large sums of money. Indeed it is not at all unlikely that within a few months good Christian capitalists will secretly thank their Lord that he sent the earthquake. In the fictional world of Anita Loos, however, rich and poor, all religions and races—and especially her heroes—march bravely back to their burnt out city, determined to rebuild together, singing the movie’s signature song. The film is but one fictional representation of the earthquake. Something about a great disaster fires the imagination. 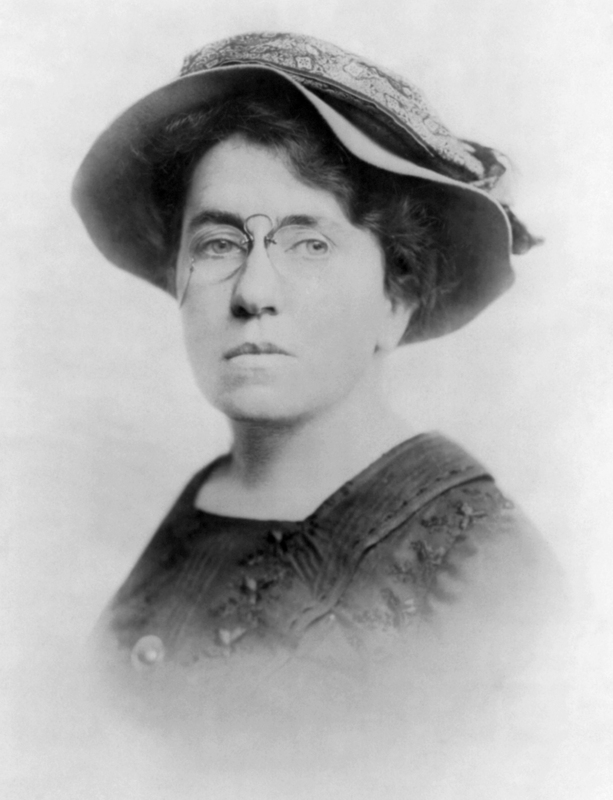 Worldcat.org lists 133 works of fiction related to the 1906 Earthquake. Goodreads has a list for middle grades and YA. The International Movie Database lists nineteen titles for keyword san-francisco-earthquake-1906. The film also taught me my first lessons in at least one romance trope. It features a hero from the wrong part of town, a bad boy with a heart of gold—heck, his best friend is a priest as played by Spencer Tracy. He’s a rogue as only Clark Gable could portray him. 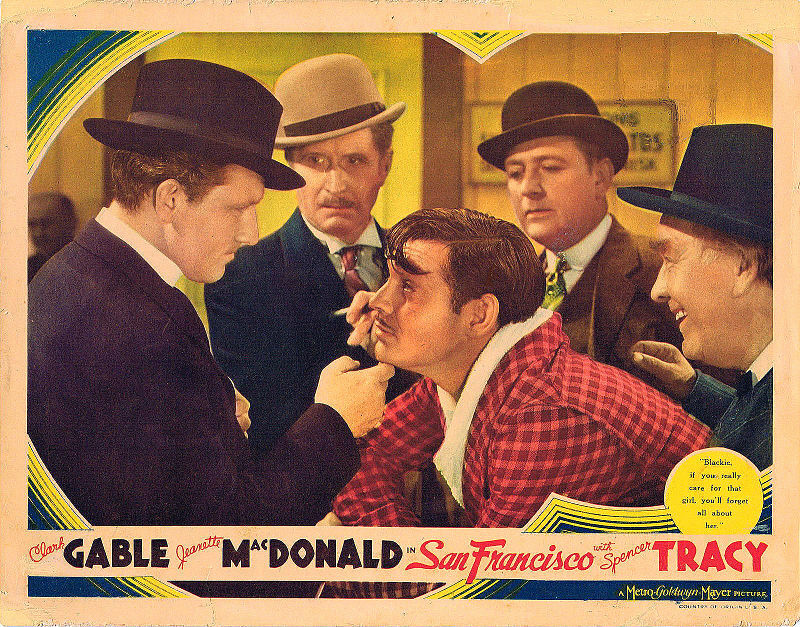 Jeanette McDonald contributed an innocent heroine caught between the bad boy and Jack Holt’s snobbish, but basically decent, man from Nob Hill. We all knew to root for Gable. The greatest villain was of course, the earthquake itself. The film managed extraordinary effects for the time, and the quake seems to last as long as the real one did. As to that song, it’s a true earworm. Click here to listen, and just try to resist singing along. Great post, Caroline! It’s a nice reminder of a horrible event, but it also is a reminder of how people from various cultures can and do work together. Loved the tie-in with the movie. How can you go wrong with Clark & Jeanette? That was a great little piece, thanks. I now have that tune in my head, and I’ll have to go in search of that movie. Great post, Caroline! If only life worked out happily ever after like it does in the movies, we would have it made. Loved the movie tie-in! I warned you it was an earworm! The movie is a traditional historical romance with some very exciting scenes of distruction. I couldn’t find a clip of the ending. As always, Linda, your blogs are too awesome. Loved this one and especially all your references to the old movie, too. I will need to keep my eye out for on Turner Classic Movies. I’m certain they will have it on. Very disturbing part about the explosions and marital law, interesting. Thanks for a great post! I’m glad you liked it. The movie is dated but good nonetheless.